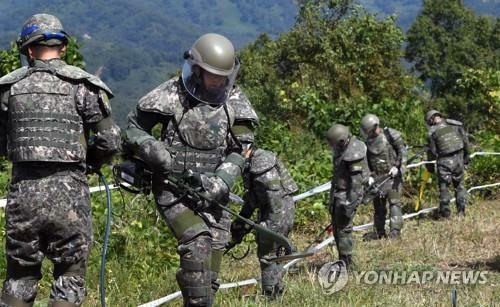 SEOUL, Oct. 19 (Yonhap) — The two Koreas are wrapping up their demining operations in part of the Demilitarized Zone (DMZ) to carry out their plan to disarm the Joint Security Area (JSA) in the buffer zone separating them, a government source here said Friday. The South Korean military has almost completed its demining work, while the North Korean military is expected to finish its work on Saturday in line with the two sides’ recent agreement aimed at reducing border tensions and preventing accidental clashes. According to the agreement signed after the third summit between President Moon Jae-in and his North Korean counterpart Kim Jong-un last month in Pyongyang, the two militaries began 20-day demining operations on Oct. 1. During the demining process, the North discovered and disposed of some five land mines, while the South found no land mines in the area of its responsibility. Under the bilateral agreement, the two sides, along with the U.N. Command (UNC), are set to withdraw their guard posts, personnel and arms from the JSA within five days of the completion of the demining operations. “As the South and North are set to abide by their agreement, they will have to withdraw them by Oct. 25,” the source said. Along with the planned withdrawal, the two Koreas and the UNC plan to adjust surveillance equipment in the JSA. The three sides are expected to hold their second trilateral meeting to discuss a set of issues, including forming an institution for the joint management of the border area following the JSA disarmament. The inter-Korean agreement fleshed out the military part of the April Moon-Kim summit declaration that pledged to transform the DMZ into a peace zone, halt all hostile acts against each other and practically eliminate the danger of war. Meanwhile, the UNC issued a press release to note that it, along with South Korea’s Joint Chiefs of Staff, has reviewed and verified the mine clearance work done to date at the JSA. “Yesterday’s UNC verification of initial mine clearance operations in the DMZ lays the foundation for future progress on the CMA (inter-Korean comprehensive military agreement) implementation,” UNC commander Gen. Vincent Brooks was quoted as saying. “UNC will continue to work closely with ROK (South Korea) and DPRK (North Korea) to synchronize implementation efforts on the way ahead,” he added. The UNC also pointed out that it supports the two Korea’s “next steps” in implementing additional practical measures of their military agreement. The remarks came amid suspicion that the U.S.-led UNC may feel uneasy about the agreement, which could hamper American forces’ front-line operations.